I’ve called tech support dozens of times over the past 30 years of using computers and software, so today was a special delight when customer support was able to help me out over the phone at no charge. My issue today was how to register my MacBook Pro and iMac computers, both bought used from private parties on craigslist. When I would login to https://supportprofile.apple.com/ and try Registering a New Product it would prompt me first for the serial number, which I had. Next, it prompted me for the original purchase date, which I didn’t have because I bought the computers used. A Google search turned up the advice to phone AppleCare at 800.692.7753. The automated attendant couldn’t understand what I wanted so forwarded me to Tech Support, which then asked for my serial number. I spoke my serial number, but the automated app couldn’t understand that, so transferred me to a human. Fortunately the human understood my serial number and my dilemma to get two used products registered online. He guessed that the MacBook Pro would accept a purchase date of July 4, 2009, which it did. Hurray! Next, I entered the serial number for the iMac and the web page didn’t even ask for a purchase date, in spite of being made in 2008. Success. 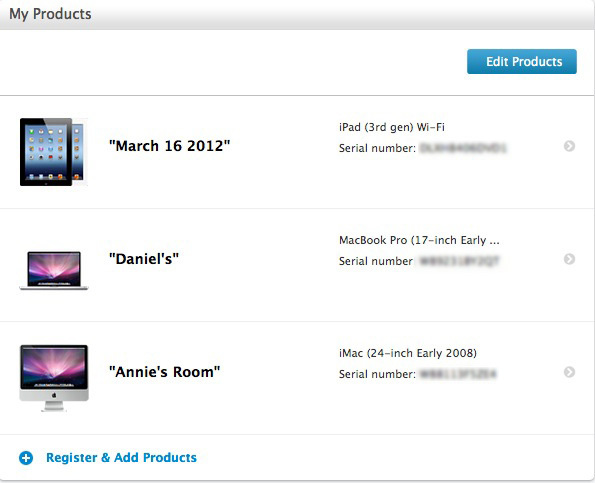 Now I have all three Apple products properly registered. For used Apple products just phone up AppleCare and tell them that you cannot register. In spite of having no AppleCare, the support guy simply helped me which in turn creates increased customer loyalty. Thank you, Apple.